If you haven’t heard about the Stanley brand, then you should. It is a remarkable example of what happens when you dedicate yourself to being the best at something for over 100 years. Eventually, you succeed. The Stanley brand is well known in the market when it comes to vacuum insulated containers. Bottles, tumblers, water jugs, hard-sided coolers; you name it. In fact, a Stanley cooler review would be incomplete without an ode to the origins of this magnificent brand. It all started in 1913 when inventor William Stanley Jr. came up with a steel bottle that had vacuum insulation on the inside. This was the first all-steel vacuum bottle, and these have since become very popular. Even today, Stanley bottles are industry leaders. Well, this time they have coolers to boot, and they certainly aren’t anything if they’re not high quality. We were skeptical at first, having reviewed coolers like Yeti and Kong, so we went all out and did some heavy tests on the cooler. However, by the time we were done, we turned into believers. We’re hoping that by the end of this review you’ll be a believer too. Fingers crossed. Introducing the Stanley Adventure Cooler! Stanley are very serious about this cooler on their website. 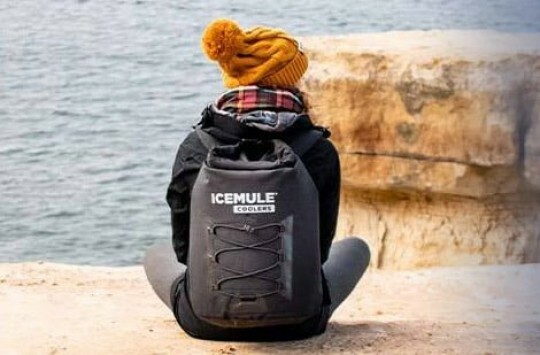 Their biggest claim is that it will keep your ice cool for up to 4 days. That’s a bold claim by regular cooler standards. We decided to be prudent and tested everything out. 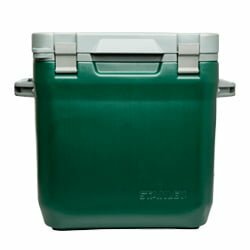 We got the Stanley Adventure 30 QT cooler and had a look at it. It’s portable and weighs an easy 13 pounds when empty. This is good as it’s easy to carry despite being so large. The inside has enough space, which makes it very ideal for a weekend out camping. 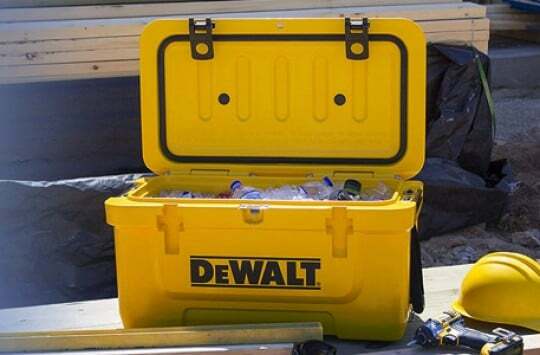 One of the things Stanley say about the cooler is that it has a very tough exterior and is leak resistant. It has a robust insulated lid that should provide excellent insulation and lock the cold in tightly no matter how hot it is outside. The drain plug at the bottom is leak-proof according to the specs, and the latches are made from the toughest plastic. It even accepts padlocks if you want to secure it even more. The handles on the side of the Stanley Adventure cooler 30 qt are pretty large. 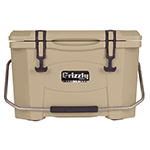 This is the same for the Stanley Adventure cooler 16 qt. They are slightly smaller on the 7qt option but are made of the same sturdy material. Large handles are essential because anyone should be able to slip their hands into the cooler’s handles. Whether you’re a child, a giant, or a normal adult wearing mittens, you shouldn’t struggle to carry your cooler. The handles also happen to be on either side of the cooler. This is an important design point. One of the biggest problems we face with many cooler designs is having one large loop handle on the top. 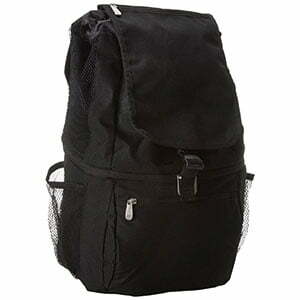 This makes the cooler slosh around when carrying with both hands, which throws the contents everywhere. Two strong handles on the side make the cooler much easier to carry around. We did some serious strength tests on this cooler to test its mettle. The first one was a drop test. If you’re taking your cooler out into the wild, you want to know you can trust it. It should be your unwavering companion wherever you go. That means it should be able to take a proper beating without giving in. The ‘beating’ we gave this cooler is a number of drop tests. We threw it from a height of 5 feet to the ground on its side and closely inspected it to see if there were any cracks. The first drop was done empty and the second with the cooler full of ice. On the first drop, it had no dent or scratch. It was almost as if it had dropped onto a mattress. On the second drop, with the cooler full, all we saw was a slight scratch on the point of contact with the ground. The rest of the cooler was doing just fine. We liked the performance, but we wanted to be sure, so we pushed things even further. We took the cooler a little higher, about 9 feet, and called timber. This left a slightly more visible mark on the cooler, with the point of impact being bent inwards. However, it wasn’t serious, and upon checking the inside of the cooler, we saw that the foam remained intact. The cooler was also functioning perfectly. It wasn’t hard giving it a quality score of 5 in this case. Next we threw the cooler on each of its handles to see if they would survive. We’re proud to say they did. They only had a scratch or two at the point of impact and nothing more. The features of this cooler are, arguably, its greatest strength. The thick foam on the inside is said to keep your ice cool and solid for an equally solid 4 days (for the 16qt it is 36 hours, the 7qt will keep ice for about 27 hours). The gasket on the lid is supposed to ensure excellent insulation and, coupled with the powerful latches on the outside, a leak proof lid. The flat surface of the top should be a great place to sit when you’re tired. The drain plug should be highly efficient and leak proof. 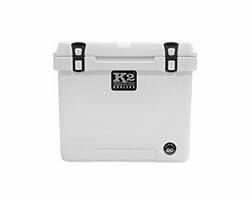 The plastic is BPA free, and the inside of the cooler is insanely easy to clean, not to mention odor resistant and stain resistant. We decided to put it to the test again and see just how many of Stanley’s claims were true. The first one was the ice test. The good people at Stanley said the cooler had an ice retention time of 4 days, so we decided to see if that was true. We put in about 24 pounds of ice into the cooler, which filled about three quarters of the ice chest, and filled in the rest with filled water bottles. We tied it shut and left it like that. Now, there’s no ideal temperature to test your cooler’s ice retention and no industry standard for sure. However, we thought room temperature would be okay. So we put it in a corner in a room and forgot about it for the next 4 days; at least we tried to forget about it. We were definitely anxious to find out, though, and it took a lot of self-control not to keep opening the lid and have a sneak peek every few hours or so. We put the ice in on a Monday around 4 pm. On Friday at 3:55 pm we were standing religiously around the cooler, waiting for the clock to strike 4 so we could finally have a look inside. The moment came, and we were all pleasantly surprised to find out that the ice was still there. Some of it had melted but there were still some solid cubes. It looked like it could easily take another 1-2 days. In fact, we decided to push it even further. We closed the lid again and left the cooler there for 2 more days. Some ice was still there. The guys at Stanley have outdone themselves! We gave the ice retention a rating of 4.5 because of this. We shaved off the .5 rating because, while the ice retention is great, it’s still no Yeti or Yeti-like cooler (Yeti’s boast up to 10 days ice retention). The overall features, however, easily deserved a rating of 4.8. 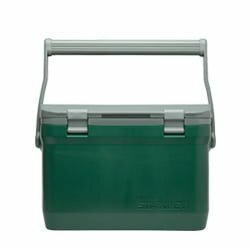 Adventure coolers come – as you may expect – in a Dark Green color which is what we’d actually expect from Stanley (the “Stanley Green” is a color of Stanley brand and a part of their identity). But wait, there’s more. If you opt for a 16-quart and 7-quart models then you can also choose between Navy, Polar and Flannel Red. We especially like the red one, although it might be little bit too flashy for some. The Stanley Adventure cooler series comprises of 3 sizes: the 7-qt cooler, the 16-qt cooler, and the 30-qt cooler. There are only 3 sizes available, but at least they are distributed evenly enough that you can easily find a cooler appropriate to your specific needs. 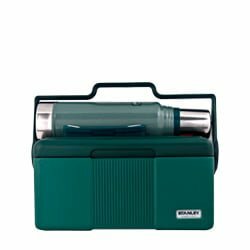 We also spotted nice gift set consisting of the 7-quart, green Stanley Heritage Cooler and the Classic Vacuum Bottle, 1.1-quart, in Hammertone Green. Together they form a perfect combo as the cooler handle locks the Bottle in place. Perfect set for those looking to take lunch up a notch with a classic touch! NOTE: As a part of the Adventure series, Stanley also offers 2-Gallon Water Jug. Find out more right here. Each Stanley adventure cooler comes with a limited lifetime warranty. This is just Stanley’s way of saying that they have a lot of faith in their products and that they were built to last. This section is there in almost all of our cooler reviews. We can’t sign off on a review without comparing a cooler to its Yeti equivalent. In this case, the Stanley Adventure cooler will be facing off against the Yeti Tundra and the Yeti Roadie. Both are premium coolers and have a lot to offer. Yeti is an industry leader known for offering the most durable materials, super long ice retention, great customizability and a wide range of options. Yeti have been around over a hundred years and are known for the same things. Stanley, however, have only recently gone into the coolers market, at least compared to Yeti. So they may seem somewhat like the new kid on the block. Here Yeti coolers are a clear winner. Who can beat 10-11 days of ice retention? Yeti coolers are known to be ruthless beasts when it comes to ice retention, and they are likely to hold the throne for a while. The Stanley Adventure cooler is not too far behind, however, and is good enough for most purposes. Unless you’re going on a pilgrimage in the desert, the ice retention capabilities of the Stanley will suffice; trust us. Here we call a tie. The Yeti and the Stanley are both hardy coolers and can take quite a beating. We have done each of the tests we did on the Stanley on Yetis before. While the Yeti seemed to fare slightly better, it was only slightly, and we can assure you your Stanley will be your companion for as long as the Yeti. Here the Yeti is a clear winner, with a wide range of color and size options. 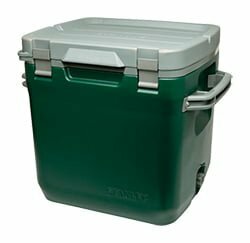 The Stanley Adventure cooler has only 3 size options. 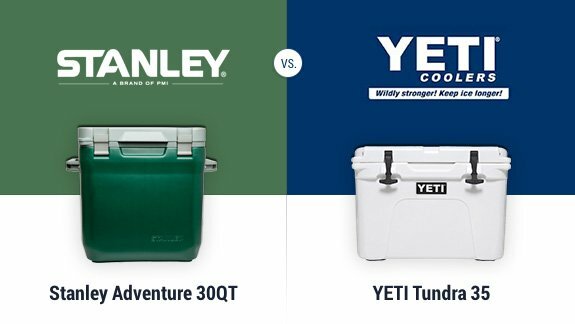 While the Stanley and the Yeti are both premium coolers, the Stanley is much cheaper. 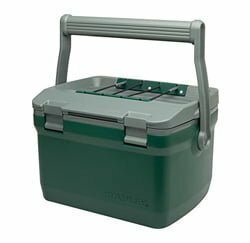 Given the difference in price, the Stanley Adventure cooler delivers an overwhelming amount of value. We give it a rating of 5 on price. Yeti is Yeti; an industry leader with exceptional quality and features. It caters to people looking for premium coolers and never disappoints. Stanley, on the other hand, also caters to people looking for premium products and never disappoints. We think you should give the Stanley a chance here, and that’s why we’re giving it an overall rating of 5. Unless you’re a die-hard Yeti fan, you should try the Stanley Adventure cooler instead. You won’t be disappointed. Rubbermaid coolers are known for giving good value at a low and affordable price. 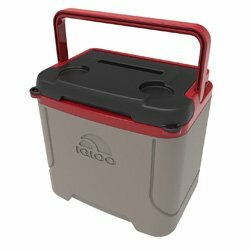 Their personal ice chest comes in 4 size options: 5 qt, 10 qt, 20 qt, 24 qt, and 34 qt. As far as size options are concerned, they’re pretty great. The ice retention and build quality, however, are inferior to those of the Stanley Adventure and do not do very well in extreme conditions. We also didn’t like the single loop handle on top. 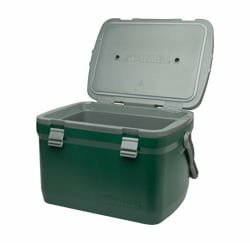 This cooler is a close competitor to the Stanley Adventure 16 qt cooler. First things first, we didn’t like the handle. It’s a single loop handle on top, and we know that won’t be great for carrying with both hands. 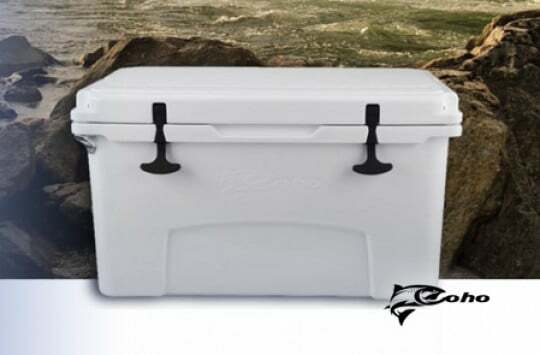 For the price, this cooler has very good ice retention capabilities and almost matches the Stanley Adventure. The material, however, isn’t as robust as what you would get on the Stanley Adventure. 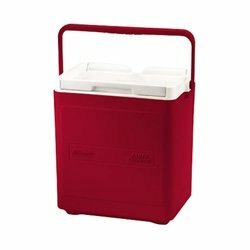 This cooler is great in the size department, offering a full 18 qt capacity. It has a few problems, though: it sweats, and can leak like crazy in certain conditions, the handle is a single loop handle, and the design isn’t as good looking as the Stanley Adventure design. The coolers mentioned above are steals if you’re on a tight budget. They have a few problems, but they offer good value nonetheless. If your budget permits, however, go for premium quality. The Stanley Adventure will give you everything you need and last a lifetime. 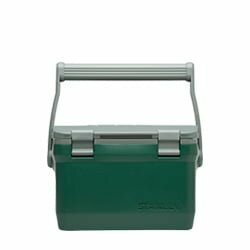 You can buy Stanley Adventure coolers in lots of places online, including their website. We, however, strongly recommend buying your Stanley Adventure cooler from Amazon. Amazon is a great online marketplace that offers highly competitive prices on tons of items, coolers including. You also have buyer protection in case you’re not satisfied with your purchase and want to return the product. Stanley has been in the game for a long time, and they’re bringing all their expertise to bear in their Stanley Adventure cooler series. If you’re looking for something unique that does the job and manages to be badass at it, then we hope this Stanley cooler review has convinced you that the Adventure series is the right place to look. You won’t be dissapointed. Stanley caters to people looking for premium products and never disappoints. We think you should give the Stanley Adventure Cooler a chance here, and that’s why we’re giving it an overall rating of 4.8. It is our policy to make every effort to respect the copyrights of outside parties. If you believe that your copyright has been misused, please provide us with a message stating your position and we will endeavor to correct any misuse immediately. Best Party Cooler? These Ice Chests Are Suited For A Good Time! Tumbler Wars: What’s The Best Tumbler In 2019? Best Insulated Baby Bottle Cooler Bags – Who Said Babies Can’t Be Cool Too? Yeti Silo Review – A Water Cooler that Fits Your Lifestyle…but Does It Perform? nICE Cooler Review: Bang or Bust? And How Does it Compare vs Yeti? 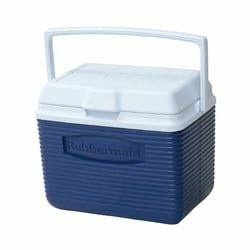 Best Camping Cooler? A Bear Proof One That’s For Sure! Bestcooler.reviews, established in 2015, is a leading blog-style magazine dedicated to reviewing and blogging about coolers. Both co-founders of the site, Luke and Greg, are two genuine cooler geeks and have been so for ages. 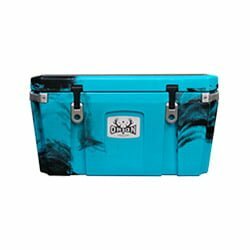 Both guys share their passion on this website, covering different types of coolers, posting in-depth buying guides and reviewing tens of different products every year. Find more information in the About Us section. bestcooler.reviews is a participant in the Amazon Services LLC Associates Program, an affiliate advertising program designed to provide a means for sites to earn advertising fees by advertising and linking to Amazon.com. Amazon and the Amazon logo are trademarks of Amazon.com, Inc. or its affiliates. Please refer to our Privacy & Affiliate policy for details.